I present Genron 5. The theme of this issue is the ghostly body. By ghostly I mean both the present and non-present; that is, things that one can and simultaneously cannot see here and now. I use ghostly to refer to such duality. The body as seen on the stage is truly ghostly. Here and now the actor is performing onstage to summon something not present. The character the actor portrays does not exist. Generally, any narrative is the summoning of something not present through the telling of story. No culture exists without narrative. Thus, no culture can come into being without ghosts. However, as the media supporting narrative become technologically more complex, the opacity of these ghosts also increases. Just as stage actors are ghosts, so too are screen actors and characters seen through the interfaces of computers and games. However, there are differences that cannot be disregarded. Stage actors are present on the stage. Screen actors, in contrast, are not present on the screen; rather, what exists on the screen is a copied image of the actor’s body, nothing more than a trace of their presence. Characters seen through computer interfaces do not even exist as copied images. The fundamental form of these characters is just data, and their bodies are nothing more than the output of calculations. In our age, we are surrounded by ghosts. The age of media is the age of ghosts. In this issue, we explore ghosts in modern society from various angles, considering everything from philosophy to literary, dramatic, and film theory. At the center of this volume is a report of a three-day seminar held in the autumn of 2016 at the mountain arts village that Tadashi Suzuki has been building over the course of forty years. As I describe in detail in a separate article, at the seminar, directors, dancers, artists, sociologists, and critics congregated, engaging in lively discussion about ghosts and the body. We have added to this issue a conversation between Norimizu Ameya and Atsushi Sasaki on non-presence and pieces on “hauntology” à la Derrida by Hidenaga Otori from the perspective of dance, Yuichi Kinoshita from the perspective of kabuki, Ryota Fukushima from the perspective of literature, and Daisuke Watanabe from the perspective of film. From these articles the reader may begin to observe how the theme of ghosts continues to appear (like ghosts). Moreover, the various methods used to summon things not present in the here and now will be demonstrated, along with how they can be perceived to be at the forefront of contemporary arts. Please enjoy. In each of my prefaces, up until our latest issue, Genron 4, I have discussed nothing but the raison d’être of philosophy and criticism. In Japan today, philosophical thought is disregarded all too easily. Everyone analyzes only the secular reality that is present here and now. That, however, is unacceptable to me. As I have stressed repeatedly, Genron was launched to change this lamentable situation. Yet, it might be time to stop making excuses. Over three issues, Genron 1, Genron 2, and Genron 4, we presented volumes on the history of criticism in contemporary Japan. I hope you have been convinced that criticism has long been present in Japan, that it is still needed, and that what is called criticism here is a philosophical act, different from mere social analysis and cultural review. In addition, just before the publication of this issue, I released Genron 0: A Philosophy of the Tourist as a special issue, authored entirely by me. Therein, I attempted to describe as simply as possible my conception of contemporary society and the human condition, which supports the project of this magazine. For those agreeing with my claim that it is necessary to introduce new criticism but wonder what it should be, I attempted to provide clear answers. In Genron 4, I demonstrated that modern society required new criticism. In Genron 0, I argued that new criticism should be defined as a “touristic” way of thinking. Here, I am editing this magazine to put this touristic criticism into practice. I will send out this issue of Genron assuming these premises to be already shared among readers. In fact, I am becoming tired of explaining this magazine’s raison d’être in every issue. It is self-evident that new criticism is necessary. What is extraordinary is that this has been forgotten for the last ten years in Japan. From now on, I will directly write and publish about criticism itself, without any unwieldy excuses for the necessity for criticism. This issue, Genron 5, is the first of this new course. But the question of the ghostly body is not unrelated to the context of the restoration of criticism explored in previous issues. 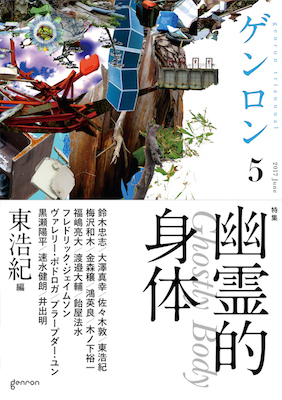 The articles in this issue can be read as independent inquiries into theatrical theory or the theory of the body, while at the same time, I must admit that the decision to make ghosts the main theme of this issue is itself deeply connected to the arguments of previous issues and Genron 0. To reiterate, the word ghost here is used to indicate something with a dual existence; something that gives the illusion of existing here and now although it does not actually exist. If this is so, ghost can also be understood as nothing other than what our criticism takes as the object of thought. Why? This is because criticism, or the touristic way of thinking that we are trying to introduce here, should not be understood as a discourse clinging to visible present reality, or one that develops invisible, absent ideas, but as a way of thinking in between. In my book Weak Connections and in Genron 0 I expressed this intermediateness of thought as not being the way of a villager (who sees only the visible) or that of a traveler (who sees the invisible) but that of a tourist. In other words, criticism is an act of vision. Critics should not just analyze what is visible and present (that is the job of journalists and sociologists). However, by the same token, they should also not only dream of the invisible and absent (which may be the job of artists). Critics must have unique eyes that see the invisible within the visible world. In other words, they must have an eye for ghosts. Criticism is seeing ghosts. That is why critics are ostracized, similar to the way those who see ghosts at a haunted inn are ostracized. The owner of the inn is sure to want to say that there are no ghosts, that there is no problem whatsoever. Nevertheless, there is certainly something present there. Even if there are no ghosts physically present, there is still a condition in which you see ghosts. It is the work of a critic to mention that. I said I would stop elaborating on criticism but went ahead and elaborated on it anyway. If I am possessed by something it must be the ghost of criticism. I would like to briefly add a few ideas that I was unable to present at the seminar. I have talked about eyes. Critics can see ghosts, but at the same time they cannot see. To criticize, that is, to see ghosts, they need unique eyes. But the use of this metaphor of eyes to define criticism is not unique. Paul de Man published the collection of criticism titled Blindness and Insight. Kojin Karatani, who is greatly influenced by him, argues in Transcritique that parallax is a key word for understanding criticism. Slavoj Žižek has published a book entitled Parallax View, drawing on Karatani. What is asserted there, to roughly summarize, is the observation that a critic’s insight into something is always supported by a blindness about another thing, or that, more fundamentally, a critic’s insight is something given by two superimposed visions. In other words, critics must simultaneously have one eye that sees (insight) and another that does not (blindness). This is what de Man, Karatani, and Žižek have argued in common. I can update this metaphor of the eyes by referencing recent visual studies and media theories. visible and the invisible. I believe that in our 21st century postmodern society, everyone should have superimposed eyes that can see ghosts; that is, everyone should become a bit of a critic. The postmodern is an age of ghosts and an age of criticism. It is also an age in which everyone needs the superposition of different eyes that see different things. Going forward, I will develop this idea in our sister magazine, the monthly e-magazine Genron β. I hope you read it together with this issue. On the border between Toyama Prefecture and Gifu Prefecture, among the mountains and near the villages of Shirakawa-go and Gokayama (which are known for their gassho-zukuri architectural style), lies Toga Village (incorporated into Nanto City in 2004). The village has a mere 600 residents (2010 population data), is two hours from Toyama City by car, and is isolated by heavy snow in the winter. In 1976, Tadashi Suzuki and his theater troupe SCOT (Suzuki Company of Toga) moved to this small, remote village. Toga Village is a renowned mecca of theater. It has a theater designed by Arata Isozaki, a stage upon which Shuji Terayama once performed, and a library built with donations from the University of California and other organizations (where the troupe presently has its offices). Suzuki abandoned Tokyo for Toga’s remote mountains; yet the mountains maintain a connection to the world. When I first set foot in Toga Village in summer 2015 for a theater festival, I was mesmerized by this paradox and hoped to hold a Genron event there one day, because this paradox of reaching out by means of enclosure was also something that Genron was pursuing. Such was the impetus for the “Genron Toga Seminar,” held on September 10–12, 2016 and described in this volume. Forty people, from their twenties to their fifties, participated. Only a few people had experience in theater. The ratio of men to women was about two to one. All attendees, including the instructors, stayed in the lodging facilities on the grounds of Toga Art Park, participating in all aspects of the seminar together, including meals and rest. As shown by the program schedule (see below), the seminar was packed with lectures, workshops, and demonstrations from the time of arrival to the moment of departure. It was organized around the lectures and workshops and we asked Oriza Hirata to lead the latter. Even though we were able to substantially capture the lectures, which featured Masachi Osawa and Atsushi Sasaki, in this volume, it was impossible to recreate the workshops in words due to their format. I observed both days of Hirata’s workshops and will simply note that I was astonished by his masterful guidance. I certainly recommend them to readers who have not had the chance to partake in this experience. We established the seminar theme as “Representing the Ghostly Body.” I explain our reasons for choosing this theme in the transcript of the symposium, so I will not repeat myself here. I can add that, while deciding the theme, I was thinking about how Toga Village was like a ghost town. Once a year, theater people from Japan and beyond briefly gather in this remote mountain village that is suffering from depopulation and then leave. Once there, people are forced to leave behind their human attributes and act as if they were ghosts. Perhaps that is why Suzuki withdrew to this land. Whereas the cacophony of the living is confined to regions and epochs, the murmurs of ghosts have no such boundaries. I wanted to ponder the importance of this experience anew with my fellow lecturers and participants, precisely because “real-time” and “connectivity” among the living are such celebrated concepts today. That being the case, it might have been more fitting to call our theme “Becoming Ghosts.” I wonder if our participants succeeded in becoming ghosts over the course of those three days. Finally, I wish to thank Tadashi Suzuki and Yoshie Shigemasa of the SCOT theater troupe for their assistance in making this seminar possible. Special Thanks to: SCOT, H.I.S. Co., Ltd. The revenant is one of the major concepts of Jacques Derrida, defined as “a non-present presence that does not exist in reality, but which cannot be forgotten and obstinately returns (revenir) to influence reality.” The theme of the Toga seminar, “Representing the Ghostly Body,” as proposed by the organizer Hiroki Azuma, connects this concept of the ghost with the question of the social reach of bodily expressions in performing arts in the present age, which is becoming increasingly information-based. In the first joint discussion held on the first day of the seminar, the artist Kazuki Umezawa and the choreographer Jo Kanamori each presented on this theme as it relates to their own work, and a discussion was held afterwards among the sociologist Masachi Osawa, the critic Atsushi Sasaki, and Azuma. Umezawa belongs to the digital native generation. As an artist, he expresses the internet with its excess of information in paintings. His production style, printing digital collages and improving them, involves little movement of the body, except the violent driving of the fingertips. To provide an example of his driven fingertips in from digital culture, he played a music video game for the audience, mentioning that the dynamism of access itself――the fact that with just the click of a mouse his fingertips are connected to the limitlessness of the internet――represents to him embodiment and reality. Kanamori, heading the dance collective Noism, opined that to those involved in dance in Japan, the “West” is the largest ghost. According to him, Japanese dancers are neither the antithesis to nor the imitation of the West, and they should create a new dance synthesizing the West and the East. He then introduced the “Noism method,” a unique training method for bodily control, influenced by the theater of Tadashi Suzuki and devised by examining Japanese bodily sensations anew. Sasaki in turn considers Umezawa’s touch in painting and Kanamori’s question of control in dance as issues of “whether painting becomes painting due to touch” and “where movement becomes dance,” asking whether what exists in those gaps is itself the ghost. Azuma enumerates that this interpretation of the ghost is similar to Osawa’s concept of the “instance of the third person.” Osawa states that what exists in the interspace between presence and non-presence was originally supposed to be an entity that “exists even though it is unclear whether or not it exists,” but today it appears on screens; now, recollecting even the sensation of touch is itself new. Finally, Azuma recapitulates the discussion, elaborating that art and philosophy ought to become an interface connecting this world to the next world, and he indicates that the idea of “touch,” repeated throughout the discussion, can act as a key for considering the possibilities of bodily expression today. The Toga Seminar was held at the headquarters of Tadashi Suzuki, a theater director of global renown, at Toga Art Park in Toga Village, Toyama Prefecture. On the first day, participants observed rehearsals for Suzuki’s theater productions “Electra” (Hofmannsthal) and Kachi Kachi Yama (Osamu Dazai). During the evening program on the second day, Masachi Osawa and Hiroki Azuma interviewed Suzuki on his views concerning the issue of the body in his works. The interviewers began by asking about the “Suzuki Method” that the director had developed for training actors, based on the feet and walking. After commenting that becoming a biped was the point at which humans diverged from apes, Osawa asked Suzuki why he focused on the feet. Suzuki explained that as humans have evolved, their separation from the ground has tended to increase. For the Japanese arts, the sensation of speaking to ancestral spirits in the ground was traditionally at the foundation of bodily sensations. Suzuki suggested that theater can present contemporary society with critical viewpoints by examining the relation between the body and the ground, as well as by investigating ancestry and history. Afterwards, Azuma inquired about the role of the wheelchair, which appears frequently in Suzuki’s productions. While wheelchairs appear in these productions as a symbol of social illness, at the same time the actors themselves use them to move in superhuman ways and at ferocious speeds. Suzuki explained that when humans take foreign objects like wheelchairs and incorporate them into their own flesh, the structure of their entire body changes, creating a somesthetic shift. This is no different in operating a mechanical shovel or driving a car. Azuma noted that Suzuki’s line of inquiry resembles Jacques Derrida’s conception of écriture, and he also indicated the parallels between the idea of the “phantom limb,” where people who have lost a limb still feel as if they possess it, and the wheelchair in Suzuki’s productions. Suzuki stated that he privileges “limitations” in both his own method and the use of wheelchairs. Beethoven, who lost his hearing, and the onnagata (male kabuki actors who play the role of women) both display the spirit of creativity in their ability to use their given limitations. Working in Toga Village, a place far removed from Tokyo, also serves as a limiting yet creative variable. In elaborating on the creative productivity of limitations, Suzuki referred to the spatial limitation of the theater located there, a repurposed home built in the gassho-zukuri architectural style that calls to mind Junichiro Tanizaki’s In Praise of Shadows. He then invited the participants to visit Toga Village again in the future. At the conclusion of the three-day seminar in Toga, Hiroki Azuma, the convener of the seminar, held a symposium with Masachi Osawa and Atsushi Sasaki. Consistent with the seminar’s theme of “Representing the Ghostly Body,” the three discussed representations of ghosts in theater and film and their social significance. The symposium began with short presentations by the three participants, followed by a discussion between the presenters and a question and answer session. Sasaki argued that methods of representing ghosts differ depending on the medium and cited the example of Thai film director Apichatpong Weerasethakul, who uses visual effects to depict ghosts. He also discussed the theater of Tadashi Suzuki, in which live actors play the part of nonexistent ghosts using the unique method of sliding feet or suriashi. Osawa argued that the origins of theater and dance can be traced to the advent of upright bipedalism and the routine use of fire, which made humans conscious of darkness. He also introduced Jacques Derrida’s interest in the issue of the temporality of salvation, along with Derrida’s insistence on the importance of retaining the idea of salvation as something “yet to arrive.” Theater and dance are means of making that which is yet to arrive appear before the eye. Azuma referenced Derrida’s 1993 work Specters of Marx in observing that Derrida explored the idea of ghosts from the perspectives of technology, politics, and time. He then argued that disconnects in time are crucial to the appearance of ghosts, and that one cannot sense the ghostly in a society in which connections take place in real time through social media such as Twitter and Facebook. Furthermore, he argued that the kata that appears in theater and the arts enables the insertion of the past into the temporality of real time. During the discussion period, the presenters used Freud’s idea of the uncanny as a point of departure in exploring the uncanniness of ghosts and robots. According to Freud, people experience an uncanny feeling when they confront something that is at the same time both far different from oneself and somehow familiar. Apichatpong’s films precisely depict this familiarity of ghosts. At the end of the question and answer portion of the event, a participant suggested that sound is ghostly in its ability to move through matter. Sasaki replied that sounds are essentially vibrations and are thus actual rather than ghostly. To this comment, Azuma responded that “sound and tactile sensibility have been a hidden theme throughout the seminar, beginning with the performance of Tadashi Suzuki and the presentation of Kazuki Umezawa on the first day.” The three-day seminar concluded with the acknowledgment of the need to further explore the relation between ghosts and sound. Norimizu Ameya has been challenging the possibilities of a new form of theater throughout his career. In 1978, at the age of seventeen, he joined Juro Kara’s Situation Theatre. In 1983, he founded his own troupe, Tokyo Grand Guignol, which disbanded after only two years. Subsequently, he shifted his forum of activity to contemporary art, distancing himself from theater. However, in 2007, more than two decades later, Ameya returned. After the 2011 earthquake in 2014, Blue Sheet, which he produced with high school students from Iwaki, won the Kishida Prize for Drama. The awarding of this prize to Blue Sheet, which was inextricably linked with the realities of the students who participated in its performance, was a momentous event that shook the concept of drama itself. Ameya stated that all his activities, even those that do not look like theater, are, in fact, “theater.” What, then, is theater? For Ameya, all theater is the reality that someone in front of you is performing fiction, while also being a document of that process. For Ameya, the phenomenon that begins when the curtain rises and continues throughout the duration of the performance itself is theater. Ameya’s works rely heavily on the notion of participation. However, even if an actor is performing “oneself,” by virtue of the performative act, the actor plays the role of the “self.” In addition, the role played is always the “other” to the actor playing the role, and, as such, the actor can never become an actual participant. In this case, the “self” is both the self and not the self. Theater is also the act of the present “self” that is living, while embodying at least half of “the possibility that the self is not the self.” Ameya calls this “half and half,” which serves as the guiding principle of his activities. Finally, the names of people and all man-made things are fictions of some type. This is the same for theatrical “conventions” shown on stage. Attentiveness to this fact is the foundation of Ameya’s activities, which attempt to change the shape of everyday lives by producing new fiction. The basis of Ameya’s theater is powerfully linked to fiction and imagination, that is, the essence of human life. The shared perception of the 20th century is one of nausea. In this essay, the critic Hidenaga Otori considers the issue of existence in postwar Japan through the body of the butoh dancer Kazuo Ohno and the novel Ghosts (Shirei, 1946-95) by Yutaka Haniya. Thereafter, Otori connects Haniya’s concept of the “empty body” to Ohno’s ghostly body. The empty body draws on Haniya’s concept of the “unhappiness of the principle of identity” as its prerequisite. This principle refers to the unhappiness and irritation that come from being unable to specify exactly what one is. In Ghosts, the empty body, which represents “an existence that is continually in a state of nothingness,” is conceived as the ideal means of escaping the unhappiness of the principle of identity. The empty body, in its lack of existence, can be linked to Ohno’s ghostly body. This concept can also be connected to the sculptor Alberto Giacometti, whose works are rooted in questions of existence. In fact, Ohno has also been interested in the nothingness and the agony of the loss of self in Giacometti’s works, and these shared ideas may be observed in both Ohno’s movements and Giacometti’s sculpture. According to Otori, the butoh of existence that Ohno opened up has been inherited by Ko Murobushi’s “alien body” and updated for the 21st century. The body observed in Murobushi’s butoh, the interior of which seems to burst out from under the skin, can be linked to Ohno’s empty body, which aims to move beyond the unhappiness of the principle of identity. Murobushi’s alien body, which also aims to go beyond the limits of the human body, is a strategy for living in the 21st century offered to humanity through the genre of dance. What is the “ghostly body” in kabuki? In this essay, the theater director and researcher Yuichi Kinoshita considers the “ghostliness” residing in the “audience,” “actors,” and “plays” of kabuki. First, who are the ghosts residing in the audience? Among kabuki fans, there are those who superimpose their own lives as fans upon those of kabuki actors. Kinoshita focuses on the gaze of the audience, which overlays on the bodies of the actors’ unseen vestiges, aspirations and illusions. Kinoshita states that kabuki has two factors that serve to invite this type of gaze from its audience. First, kabuki utilizes a shumei system of stage name succession. Because the actors inherit the stage name of a parent or master across multiple generations, their bodies present on the stage are strongly tied to the spirits of those who came before them. The second factor is kata (form). In kabuki, not only the text and direction but also the characters and interpretations of the story are inherited as part of the “form.” For example, the scene “Kumagai jinya” in the play Chronicle of the Battle of Ichinotani has two forms that bear the name of actors: the “Danjuro form” and the “Shikan form.” The Danjuro form is characterized by sensitive expressions of emotion, whereas the Shikan form might be described as ensemble theater. Through the so-called ghostly elements of name and form, the spirits of the past are personified in the bodies of contemporary actors. What role do ghosts play in the kabuki play itself? In Tokaido Yotsuya kaidan and Yoshitsune and the Thousand Cherry Trees, characters who wish to communicate with later generations appear as ghosts. Kinoshita argues that ghosts in the classical performing arts appear in order to reenact history. Kabuki is a multilayered art, and the audience travels along various temporal axes within the multiple layers that are manifested on the stage. Kabuki speaks to us in the same manner in which ghosts transmit their message to the living. This essay positions the 18th century writer Akinari Ueda as one of the most cutting-edge modernist writers in Japanese literature. In general, modern literature deals with the “individual” disengaged from the community. In contrast, Akinari’s Tales of Moonlight and Rain was the first in Japanese literary history to not only summon a “spirit” that is disengaged from the community, but a demon that threatens political legitimacy. Akinari’s modernism was realized through a narrative in which the “audience,” liberated from the community, encounters a “demon” that refuses reconciliation with said community. This essay argues that the “discovery of the demon” and “discovery of the audience” were important constructive elements for Japanese modernism. The 18th century saw an accumulation of scholarship on the topic of spirits, starting with Norinaga Motoori’s hermeneutics. Although Akinari’s literature was also a part of this paradigm, Tales of Moonlight and Rain destroyed the traditional Japanese model of spirits. While in the medieval period Zeami envisaged a theater of religious salvation, Akinari composed a monstrous spirit that refuses salvation. Interestingly, while 18th century European philosophers such as Edmund Burke and Immanuel Kant were engaged in the problem of the “sublime,” Akinari, too, went beyond the Rococoan beauty of Buson Yosa to arrive at a “sublime” spirit brimming with pathos. On this point, Akinari’s “modernist” literature represents the pinnacle of 18th century Japanese aesthetics. Theories of Japanese culture have always been described as “histories of the reception of foreign cultures,” and their variations have been largely classified into two groups. The first is a dialectic between “construction” and “generation,” while the second is a “myth of tolerance.” However, both theories have their flaws. The former argues that foreign cultures are constructive and Japanese culture is generative, which has been the subject of numerous debates regarding the nature of national character and simple theories of the Japanese people. The latter has difficulty providing a theoretical answer to the question of the origin of tolerance in Japanese culture. While critically considering these two theories of Japanese culture, this article updates the dialectic between “construction” and “generation” as well as the “myth of tolerance” into a new schema. First, the dialectic between “construction” and “generation” can be replaced by a dialectic between “site” and “non-site,” which is a schema presented in the analysis of the Suijaku Mandala. Next, the “myth of tolerance” can be replaced by the “inscription of disjuncture,” based on Kojin Karatani’s theory of the kanji-kana mixed style, Leo Steinberg’s analysis of Robert Rauschenberg, and “images of manifestation” in Suijaku art. In this case, the “inscription of disjuncture” is an écriture that separates and preserves differing cultures and principles, and allows them to coexist on the same plane. Since the invention of photography and cinema, the “ghostly” has been an important element of visual culture. This essay considers how the issue of the “ghostly” has changed in 21st century visual culture, taking representations of the “face” as its point of departure. Analogue photography, which served as the basic medium of images throughout the 20th century, has frequently been discussed in tandem with ghosts. This is because analogue photographs have been said to possess “indexicality,” a concept that classical film theory has relied on in the past. By representing landscapes and objects of reality as material traces, analogue photographic images resemble ghosts, that hypothetical enemy that hovers between life and death. The “face of the invisible man,” which Akira Mizuta Lippit uses as an example of his concept of the “avisual,” also signifies an aspect of ghostly characteristics. However, it seems that the essence of the “ghostly” in images is being updated through transformations in the media environment――that is to say, the shift from “analogue to digital.” In the midst of these changes, “digital ghosts” that tend to lose their indexicality take on characteristics that allow them to link with living audiences and actual spaces in a loose and multi-layered manner, without the pretense of schematic dichotomies between real and representation as well as presence and nothingness. In closing, this essay examines digital images of “faces” processed through camera applications, such as “snow,” as the most interesting examples of such digital ghosts. As stratifications of multiple layers, these half-exposed, half-hidden faces reveal the essence of the “ghostly” in contemporary images. Furthermore, such transformations in the image of the “face” raise questions regarding changes in “publicness” through visual media. Fascism of Love and Fantasy (Ai to genso no fashizumu, 1987) and Exodus of the Country of Hope (Kibo no kuni no ekusodasu, 2000) are both Ryu Murakami novels depicting the establishment of independent states. In Fascism of Love and Fantasy, a fascist party plots a coup d’état and ultimately succeeds in seceding Hokkaido from Japan as an independent state. In contrast, the mass truancy of junior high school students is the theme of Exodus of the Country of Hope, wherein the truants build a community using the internet, launch an IT business, and circulate their own regional currency, thereby establishing in the end what amounts to an independent state. These works, which deal with the idea of a coup d’état, were written with the February 26 incident and Yukio Mishima’s suicide in mind. Yet, neither has referred to the emperor system. Reflecting on Japanese history, it can be observed that there has never been political upheaval or a coup d’état in which the emperor was completely uninvolved. Thus, it is unnatural for these works to exclude the emperor system and Japanese social ambiguities. It is precisely the cause of this unnaturalness that we must decipher. Indeed, these works are, in fact, attempts to deal with the paradox of the emperor system.